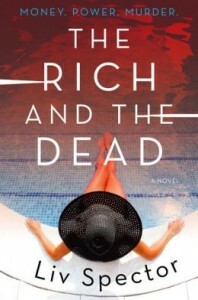 Keep reading to enter our giveaway and read an excerpt from The Rich and the Dead! I can’t tell you how much fun I had reading this book, it was pure indulgence. Interesting characters, fun dialogue and a mass murder mystery to solve made this one impossible to put down. I liked that the murder could have been committed by any number of people. It made the clues fun to follow and I second guessed myself every time I thought I had it all figured out. In the end, I was surprised by the identity of the Star Island killer and shocked at the true story behind the mysterious Janis Club – what a great twist! I was also thoroughly entertained along the way. I am excited that this is the beginning of a new series and am looking forward to seeing Lila Day and Teddy Hawkins team up again to solve more sensational crimes. Long after everyone else had moved on, one local detective was left following leads, checking and rechecking evidence, and searching for a break in a case so cold even she knew there was little hope in catching the killer. Only one detective was foolish enough to care, and it nearly cost her everything. Thanks for sharing your thoughts on this new mystery with us. It does sound like a fun read! Sounds like a fun read, please enter me in the contest to win!